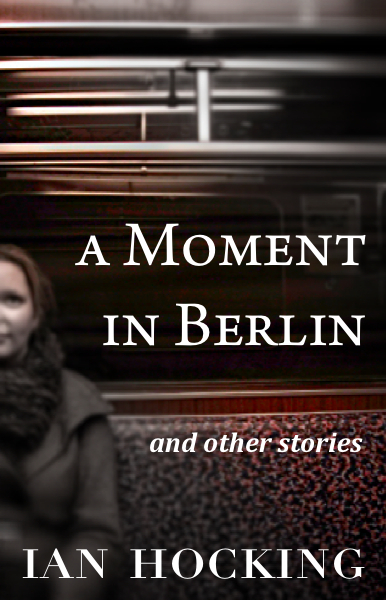 This week, I’ve pub­lished my third Kindle book, A Moment in Berlin and Other Stories. It’s short­er than the first two, and falls into both the ‘story story’ and ‘lit­er­ary fic­tion’ domains, so I don’t expect it to gen­er­ate any­thing like the sales or read­er feed­back of Déjà Vu and Flashback. However, it feels good to get it out there. I bought the cov­er image from iStockPhoto, search­ing for “Berlin”. It cost me £50 to pur­chase the image at a good res­ol­u­tion. I’m allowed to repro­duce it no more than 499,999 times — which is cer­tainly doable. I blew up the image using Pixelmator, applied a depth-of-field fil­ter to blur out the top right and bot­tom left por­tions of the pic­ture, and increased the sat­ur­a­tion along the diag­on­al. It’s cur­rently on sale at the low­est price Amazon offers (86p). I would prefer some­thing lower, giv­en that Déjà Vu is selling for the same amount, but I think 86p is a fair enough price for four short stor­ies. The stor­ies are, of course, hor­ribly depress­ing.